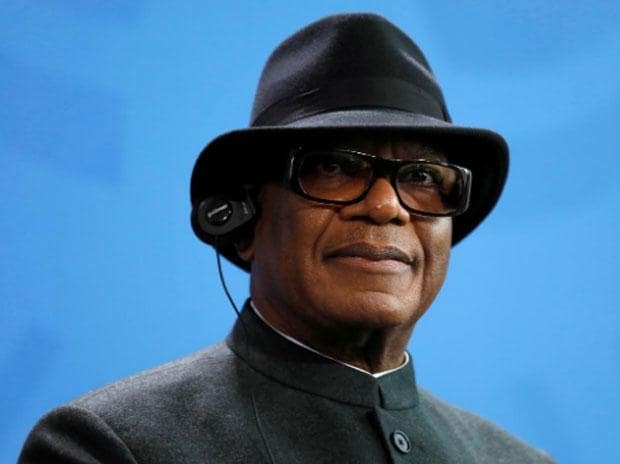 Malian President Ibrahim Boubacar Keita vowed Monday to beef up security as he visited a village where more some 160 people were killed by suspected militiamen from a rival ethnic group. "We need security here -- this is your mission," Keita said, giving a public order to military chief General Aboulaye Coulibaly, who was abruptly appointed on Sunday after the massacre. "Justice will be done," he vowed. The deadly raid took place on Saturday in the village of Ogassogou, home to the Fulani herding community, near the town of Mopti in central Mali. A militia from the Dogon ethnic group -- a hunting and farming community with a long history of tension with the Fulani over access to land -- is suspected to have carried out the raid. State television ORTM on Sunday gave a "provisional toll" of 136 dead. Late Monday a local official and a Mali security force source said the toll had risen to 160 and could rise further. "The new count is 160 dead and it will probably be higher still," local councillor Amadou Diallo told AFP, denouncing an attack he said amounted to "ethnic cleansing." An AFP reporter on Monday said many homes in the village had been burned down and the ground was littered with corpses. "I have never seen anything like that. They came, they shot people, burned homes, killed the babies," said 75-year-old survivor Ali Diallo. The perpetrators "are not jihadists. They are traditional hunters," a health worker told AFP. Aurelien Tobie, the chief expert on the Sahel region at the Stockholm International Peace Research Institute, told AFP that "it is very hard to make a true, legitimate identification of who is a militiaman, who is a jihadist, (or) who is the 'enemy' of whom." "Everyone is armed but membership of one group or another fluctuates with personal, family, community or circumstantial interests," he said. The victims, many of them woman and children, were shot or hacked to death with machetes, a security source told AFP. It was the deadliest attack in Mali since the 2013 French-led military intervention that drove back jihadist groups who had taken control of the north of the country. So-called self-defence groups have emerged in the Dogon community in the declared role of providing protection against the insurgents. But these militias have also used their status to attack the Fulani. Fatou Bensouda, prosecutor of the International Criminal Court (ICC), on Monday condemned the "vicious attacks" and urged "all parties to refrain from resorting to violence". She urged "the investigation and prosecution of those who participated in or otherwise contributed to what appears to be egregious crimes which may fall under the jurisdiction" of the ICC. In January, Dogon fighters were blamed for the deaths of 37 people in another Fulani village, Koulogon, in the same region. On Sunday, Keita fired the heads of the army and air force and replaced armed forces chief of staff M'Bemba Moussa Keita with Coulibaly. The Dogon militia, called the Dan Nan Ambassagou, was ordered to be dissolved.